Submitted article and pictures by Tammie Hache. Bird watching and feeding are two immensely enjoyable activities. You don’t have to do both but one does seem to naturally go hand in hand with the other. Birds are much easier to watch when they regularly show up in your yard for a buffet! If you do feed the birds in the Manitouwadge area, you will see some regular feeder visitors and some seasonal visitors. Regular feeder birds (here all year round) would include Black Capped chickadees, Red Breasted nuthatches, Blue Jays, Gray Jays (also called Whiskey Jacks), Evening grosbeaks, Downy woodpeckers and Hairy woodpeckers. 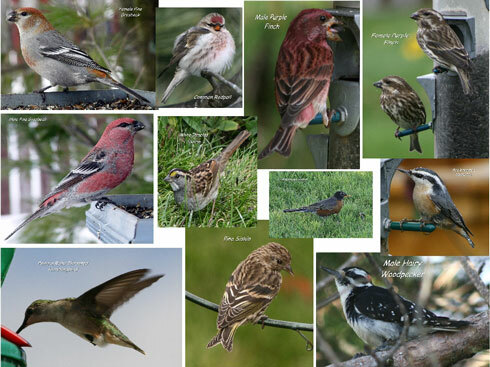 Seasonal or migratory feeder visitors would include Pine grosbeaks, Rose Breasted grosbeaks, Common redpolls, Pine siskins, Purple finches, American goldfinches and Ruby Throated hummingbirds. There are many types of feeders available but the most popular and user friendly are gazebo style feeders and tube feeders. An open platform feeder is very popular for birds like grosbeaks. The most nutritious food you could offer would be black oil sunflower seed but don’t forget to offer suet for the woodpeckers. Water is also very important to birds’ health and should be offered whenever temperatures permit. You don’t even need a full fledged birdbath ….. a shallow pan on the ground will do. Just keep water no more than 2½ inches deep. Shelter is key to a bird’s feeling safe in your yard. Place your feeders near trees or shrubs but not right in them. If you wander around the area, you will find different species of birds than what shows up at your feeders. At the local golf course, you can see Canada geese, Snow geese, Sandhill cranes and many species of ducks along with American robins and Dark Eyed juncos. Around Manitouwadge Lake, you can see American pipits, Horned larks, many warbler species, many duck species, gulls, Great Blue herons, Bald eagles, ospreyand kingfishers. A walk along local trails into the woods can show you Pileated woodpeckers (our largest woodpecker at 18″ tall), Three Toed woodpeckers, Red Eyed vireos, Philadelphia vireos, American redstarts, Ruffed grouse, Spruce grouse, etc. Perry Lake Trail is a wonderful hike where you can see many types of wildflowers and plants, butterflies, dragonflies, ducks, blackbirds, swallows, loons, etc. No matter the season, Manitouwadge is a little oasis if you’re looking for birds, wild flowers, native plants, butterflies, wildlife, etc. You never know what you might see when you just walk around.